So much yarn, so little time. : Competition time once more! 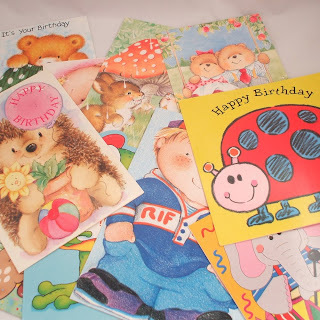 Yet more finds from my "decorating tidy up"
I have a dozen birthday cards suitable for children (or the young at heart!) with no envelopes - but they'll all fit in "normal" A5 envelopes. I think I must have bought a bumper pack and then gradually used the envelopes for other purposes - either that or they're hiding. Ideal for the busy mum whose child announces at Breakfast that his best friend's birthday is TODAY. To enter - leave me a funny story about a birthday. Easy! I'll pick the winner next weekend. To start you off - halfway through my 40th year I was moaning about how I didn't like being 40. Mr Nifty looked at me with his usual patient expression and announced that I was actually still 39. I'd lost count.